Gri Fel and Terapishim would shortly be getting preliminary approval – which meant that the real fireworks would be starting as they got into the “demonstrate your competence” phase of the approval process – part of which was always “keep your competition and opponents from ruining your demonstration”. A certain amount of consternation was working it’s way through the Ministry of Finance. The total number of artifacts that this god-blooded child had “found” were minuscule when compared to the totals to be found in Yu-Shan of course – but they included these “Lesser Exaltations” and enough magical armor to outfit every Celestial Lion in Yu-Shan! For an individual – and especially such a minor one – it was a fabulous fortune, vast enough that it was still being tabulated. Who knew what else the boy might find in the depths of these “Primordial Archives”? And how had he gotten into such a place anyway? Surely Autochthon’s Jotun would have locked the door! Several requests for investigation would eventually be submitted to the Celestial Lions – and would, sooner or (most likely) later reach the levels where several of the Lions were already considering some of the results of their unofficial investigations. Across the Earth, agents both mortal and Inukami were fanning out in search of exotic magical components – drawing the attention of certain magical beings and, of course, of the American and European Masons, who were noticing the pattern… With so many items of magical significance being sought, surely some great project must be underway! Yet, oddly enough, no one seemed to know anything about it – although a few astrological forecasts pointed to something to do with Arcosanti. But what could a little colony of student-idealists devoted to environmentally-friendly architecture and industry have to do with ANYTHING? Across Yu-Shan, several gods were surprised and pleased to find that their orders had not only actually been filled, but had apparently been given a high priority! Some of that stuff had been on back order for quite some time… Prompt and efficient was their due of course – they WERE gods – but it was very unusual to actually get it! In many of the libraries of Yu-Shan – and pretty much all of the ones where Charles had access and humans worked – efficiency was rapidly going up. Charles had made a flying trip to visit and drop off Greater Rings of Thaumaturgic Mastery for the mortal librarian-aides… That was letting them rapidly catch up on the filing, indexing, and other basic work. Of course, their experiments with their new gadgets had neatly covered up Charles using the same effect to add a few cross-references here and there in a few libraries “proving” that his new Canadian “Exaltation Manses” were actually so ancient as to be almost totally forgotten – and that any incoming spirit reports about them being built were merely indications that they’d been refurbished and brought back online. That would only be useful if someone traced back the links or discovered them independently and went looking for references of course. If they were responding to reports of new manses being built, they’d never see the references because they wouldn’t be rummaging around in the records to see how old they were in the first place. Hopefully, however, the local spirits would be reporting the re-activation of something very old; it would make a lot more sense to them than the overnight construction. In a carefully-warded and sealed box, a moonsilver choker quietly twisted, it’s purpose unfulfilled. In a dark and terrible – but undisclosed – location there was bitter anger and twisted malevolence; three of his (her? it’s?) best agents – genuine Abyssal Exalted – had gone missing on what should have been a simple mission – and their Exaltations had not returned! That almost certainly meant that all three had gone renegade together! Such treachery was not to be borne! Where crystal trees rained rare liquors into a stream of intoxicating fire, while the emerald glass constantly grew, shattered into tinkling streams of multicolored music, and grew again, there was a more-or-less accidental gathering. The tale wound onward – but too quietly. Their missing guest – the one that the princes of air and darkness foretold might be the key to turning every manse in Creation into a bastion of chaos – had not yet come again into their hospitality. Perhaps it was time to take a more active hand in events. There were secrets within the Seven Whispering Winds that none but it’s masters had ever known… They would call upon the Harvest of Secret Whispers, where that which was spoken softly and in hidden places was gathered into sheathes. That might grant them wisdom to understand the visions of the Cauldron of Chaos. For once the Gaze of the Eye unbound even the Shaping of the Primordials and the rules of the Shinma. Even in it’s current form, it’s waters retained some of that potency, to look across time and into the seas of possibility. 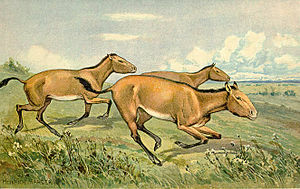 The Atlanta Museum of Natural History – thanks to pressure from its board of directors, who knew a unique attraction when they saw one – was shortly going to open it’s Hipparion exhibit. With several foals due very soon, they’d soon need to find somewhere else to keep some of them anyway. They also badly wanted another conference with Charles – both about Hipparions, about money, about credit and publication – and about what he was up to now, since speculation was beginning to make a few of them rather nervous. Despite having brought in a few physicists, they still couldn’t explain how his apparatus actually worked. Mr Montague had little time to investigate – but he had used the Efficient Secretary Technique for quite a few queries. He’d expected it to fail for anything to do with or in Dudael (or anywhere that was shielded against random intrusions, such as the Academy) – but outside of what seemed to be a few mortal school records there was virtually nothing available. Had the boy spent his entire life behind privacy wards? For most people you could at least identify their parents! Would it be worth the immense effort to try to find him in the loom? To do this, study the manse. Then make three self-powered artifacts with no attunement cost rated at the manse rating and designed to permanently merge with the manse and enhance it. Install them. As the reverse of a suite of Integrated Utility Artifacts, this adds three creation points to the manse. A manse * or ** can be enhanced in this way once, a manse *** or **** can be so enhanced twice, and a manse ***** and up can be enhanced three times – although building nine unique rating-5 artifacts to get an extra nine manse creation points is rarely all that worthwhile. In the Final Refuge of the Dragon Kings, young Rachel was finding quite a lot of information on being a Solar – along with some willing teachers, excellent training, and a fair amount of salvaged Solar-only devices. When she emerged once again she would be far more formidable than before – and well aware of how she had been used by whoever had laid a murderous compulsion on Deva Cutter and placed it in her hands. She was not pleased with that. Of course, in that refuge, with humans suddenly no longer extinct (even if none of the currently available ones were unexalted), other forces were beginning to stir. Charles was contemplating taking Deva Cutter to the Sidereals and explaining – at least a bit. If something demonic was working in secret to divide the Celestial Exalted, it would be wise to get the warning out! Still, he didn’t want to explain too much… Perhaps he could ask his Grandfather to pass the word? And someone apparently had a big enough “in” with him to get him to take time out to talk to a school full of little godblooded kids – and the kids were being pretty closemouthed about whatever it was. That was also interesting and implied either a specific interest in the kids or that someone had enough pull to… possibly get them considered for Exaltation? Unlikely; Exaltation slots rarely opened up. Internships perhaps? That would imply that someone wasn’t using the kids in a maneuver, but exerting great efforts on their behalf. That was more than enough influence to help them out if they could only tap into it! Of course Charles did need some help from some of the Sidereals; the Stargate Project would need some Sidereal input on the travel charms – and they were had to get when they were on call 24/7! Jacob Anderson was in need of a little help – and, for once, had some idea of where he might get it… That youngster he’d met in the forest had apparently casually laid a long-term ward around the place, just to keep it nice. Even more importantly, from what he’d heard, evidently the boy was capable of quickly and easily repairing manses as well. In the current situation it would be well worth discussing a little business with him. Kiko was looking into getting herself a Dreamstone. After all, every little bit helped. She was reluctant to ask Charles for any more favors at first – he’d already done so much for her – but eventually she thought back on that performance for Gri Fel. He could make minor artifacts… in minutes. No wonder he regarded them as trivial – and no wonder he treated such requests as the equivalent of “can I have five minutes of your time?”. For Charles, the two were pretty much the same thing. That was pretty weird really! It certainly didn’t match up with what the Gold Faction tutors had told her about the difficulties in creating artifacts. What was up with him? Maybe Gri-Fel would spring for lessons after he got a job again. That was pretty cool. With the Morgan Dragon-Blooded Raymond was guarding the Cartier house while they were away… While he missed them, and wished that he could have gone along, he figured it was for the best. He was one of Howard’s people anyway, not the clan’s. The clan patriarch was not quite so sanguine… The blood link was enough to let his diviners get some information – but it was absurdly cryptic! “Not dead, but not to be found; the way is shut, it is not of this world!”? Malakai Run-and-Gun hadn’t been seen in Heaven for some time. The general assumption was that he was off on Lunar business; after all, his heavenly office was fairly minor. Charles still wondered a bit about him… Malakai Run-and-Gun had requested a soulsteel artifact, but had seemed much relieved when he’d been given an orichalcum one instead. Had that request been a test? Malakai might have suspected him of being an Abyssal Exalt – but that would imply that he’d somehow recognized the nature of his Exaltation. That was possible of course – Lunars sometimes had special methods of recognizing Solars – but who knew? Still, even if Malakai knew or suspected, did it matter? They both probably had much bigger concerns – and Malakai presumably had no real reason to care if a young solar wanted to play god-blooded kid. Earth might need heroes at times – but not nearly so often any longer, and rarely kids. At the Thornhaven manse a simple cube had appeared – one foot on a side, and otherwise quite featureless. The reason why was not apparent. The Celestial Lions were evaluating the armor he’d offered them, and were impressed. It wasn’t the most powerful armor in existence – but it was versatile, flexible, fairly effective, well-concealed, and entirely un-restricting – and the boy had offered to provide them with a supply, as well as with some transport artifacts, and several other useful items. They would be checking on what sort of price he would be asking. They knew better than to expect anyone to be providing anything for free. Law enforcement had some perks, but they didn’t normally extend anywhere NEAR that far. That unfortunate cursed Lunar was off looking for a suitable situation to work off the next segment of the curse. Maella was having some difficulty transitioning to Japan. It wasn’t as bad as it might have been for a foreign mortal – she did have some good social Charms – but it was still noticeable. They’d been a gift from Vaal. Apparently Mr. Montague was making plans in his spare time for some armor that will would let him go even faster – although he wasn’t too likely to craft that himself. There wasn’t anything else she needed at the moment. Charles had offered her a vacation to make sure she could dodge any potential kidnappers – but she loved her job, and was still coming to work. She was quite happy – and while she was still a little unused to being an Exalt she was getting more comfortable with it. Charles was keeping an eye on her – and so was both her boyfriend and Rosa, who was getting most of her information on Maella through Catherine since she herself was too busy with investigations and Celestial lobbying to do much personal checking up. She might not have been able to do much of anything, but her husband was doing a good deal of the scrying on Maella. Still, the “Lesser Exaltations” included a mental catalog of most of their functions and limitations – although it didn’t cover the parts that seemed to be covered by external boosters of some sort (one or two of the better occultists among the kids said it was geomancy – but geomancy wasn’t normally something you could carry around with you!) – and that catalog was… a bit much even for most gods, much less for God-Blooded children to have! He was apparently the one who’d set this off by asking Charles for a booster item – so it fell to him to ask for a little more information about these “Lesser Exaltations”. Both of those statements were absolutely true of course – although the first set applied to his own research and the last really was a guess. It was just having them in close proximity that gave the wrong impression. Huh. Hiranaya knew he was no god – or even god-blooded – of analysis, but that sounded reasonable enough. It also, sure-as-oblivion, sounded like a Son of Lytek… Who else spent their time pondering the internal workings of Exaltations? It wasn’t like people were going around building more! The other kids were more than pleased with their assorted new powers, the essence boost, the ability to freely combine their Spirit Charms, and the other boosts… They’d never seen or heard of anything like it short of Transcendence or Exaltation itself! Charles wasn’t used to being one of the centers of attention. They thought that was REALLY lucky! Most of their parents weren’t even in with Lytek! Charles couldn’t argue with THAT. That, of course, set up yet another smokescreen of completely misleading truths for later on – when people started interviewing the students. It would protect them – AND Charles himself. This way, if he was too much to credit for a Godblooded youngster, further investigation into his background would show him to be a “lesser exalt” – apparently something so unimportant that it hadn’t made it into the wartime records. For the other kids it would mean that their powers would be firmly established as being too minor to be a threat – and it would also establish that it was no use trying to take their artifacts away from them. Now that Lytek knew that the “Lesser Exaltations” were on the loose, it would be pointless to try to hide one from him or to use one without his consent – so even killing them wouldn’t work. With any luck it would be a very VERY long time before anybody taking that route would figure out what he really was – which suited Charles just fine! Investigators would have to track his activities and realize that certain things just didn’t add up – and it would be hard to be sure even then; that was why he was going for “unprecedented” possibilities; that way no one could be quite sure of just what such an entity might or might not be able to do. Hm. There probably WAS a good of confusing things and concealing evidence – although probably under a false name and supposedly doing another job. It might be worth befriending whoever-it-was if he ever happened to run into them! Oddities were already apparent to some of course – such as “How does a small child get so many artifacts to give to customers in such a short time?” – but at least he hadn’t filled any really high-end orders yet. Eventually, of course, inquiries from the parents would start to trickle in – but, as far as Charles was concerned, “a few months from now” might as well be “forever”!